If you follow me on my Instagram accounts (@greenravenmeals and @thesimmeringpot), you’ll have seen my latest endeavours including these tasty little chips! 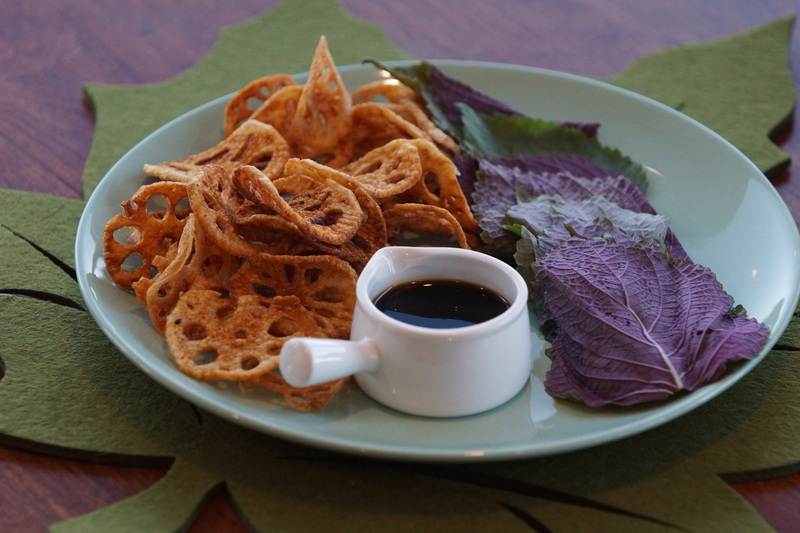 Lotus root is a slippery and slimey vegetable but delightfully crisp! I’ve had it pickled, braised and last week I decided to fry them! They have a lot of moisture and oxidize quickly so I started by peeling the outer skin off, soaking them in cold water with a few tablespoons of rice vinegar and then drying them out between paper towels! I tend to use a neutral oil like grapeseed oil for frying. I fried these on medium heat for about 3 minutes. Right out of the hot oil I sprinkled some shichimi togarashi powder (chili, sesame, peppercorns, tangerine peel) and a bit of sea salt. Shiso leaves, or Perilla leaves, are very herbaceous and fragrant. I saw them at my local Asian grocer and thought they might be a fun little wrap for the crispy chips. The flavour is quite strong so I just ripped off a piece of the leaf to eat with each chip and then dipped into the amazu sauce. Amazu sauce is basically soy sauce sweetened with sugar and rice vinegar. I also added a bit of orange zest to mine for fun. Previous So this is living eh?